Project management methodologies made simple… wow, how long do you have? There are literally dozens of methods used in project management and some of these are, well, really complicated – and they change – or evolve – continuously to bring in new research findings on effective practices. So, to take on the task of simplifying project management methodologies is not straightforward. One of the easiest ways to explore the different methodologies is to give a summary of some of the most popular approaches. This presumes that if lots of people use the method then it works… though fads and fancies might call this assumption into question. Again, to simplify this further, a methodology is just a means of getting things done – so to keep the explanation simple we will focus on how each approach chooses to get things done and leave some of the more complicated details out. Let’s start at the beginning of time in project management methods. The Project Management Institute (PMI) produced guidelines for effective practice. PMBOK is the Project Management Body of Knowledge. This means it is a collection of all the best practice and is annually updated. How does it suggest you get things done? Well, it says you should break a project into five stages: initiate, plan, execute, control, close. It essentially suggests that you organise your project into a pathway to give a clear direction for action. It is the longest running method because it is a framework that works but it is arguably just a structure rather than a comprehensive approach. However, the details of best practice as published in the PMI guidelines each year. So, if you want to learn more about what works – head to the website. This is a linear approach to project management. It presumes that one task leads onto another and then onto another until the whole project is complete. The reason for the name is because it presumes a downward flow of tasks to completion. In many ways, this is an evolution of PMBOK in that it works on the basis of distinct phases – but instead of five, there are six. As with PMBOK, the starting point is to capture the whole of the project in one document, then you analyse the needs of the project, design a method of fulfilling these, complete work, test and then release. This is a method that emerged from programming – so the model presumes you are creating software and that the coding, test, release should all happen once the whole of the programming has been completed. It is easy to transpose this method to manufacturing and construction, where there is an obvious linear workflow. Once on a waterfall pathway, the presumption is it would be too expensive to move away from the original plan so there is little need to build in too much reflection and flexibility of other methods. Agile is opposite to Waterfall. By the name you can tell that the idea is to be able to change and adapt quickly based on the needs of the project and more significantly the consumer. Ironically, the Agile PM method also emerged from programming. The idea being that you could break the release of the product into phases – called iterations, get feedback from the consumer and then adapt to make the development of the product better. In a world of smartphone apps and upgrades, it is easy to see why this is a sound model for app development at the very least. The idea is a short burst of activity based on an idea of an overall plan followed by reflection and review and potential change of the plan. This builds on the flexibility to change direction mid-project that is missing from the Waterfall method. This sounds like a positive evolution of project management and allows for teams to adapt to context and changing needs. The danger of Agile is project drift – where the reflection and adaptation of findings moves the outcome far from what was originally requested. This is a complex method and comes with a crazy amount of vocabulary that can obscure more than it illuminates. Put simply: imagine you have a team of people that goes across different silos in a company – across a specialist team. Put them in a room and tell they are responsible for a set brief and although their specialist knowledge is important they are expected to think about the whole of the project. The project is then broken down into short bursts of activities with sub-goals, followed by reflection and the design of the next portion of the project. Build in customer experience, and you will have a customer service specialist on the team, and keep working in this way until the product or project is complete. Critical Path Method (CPM) is also sometimes known as Critical Chain. Path or Chain – the metaphor is clear – this is a linear method of project management that uses milestones (the link in the chain) to build in reflection and flexibility. This means there will be a complete model of how the project should be complete and then there will be a work breakdown structure – with a duration for set tasks – with dependencies laid out. The dependencies are basically a means of indicating to those working on the project where their work will impact on the ability of the next colleague to begin their part of the project. The role of the Project Manager would be to design the path of the project in such a way that uses time and resources most efficiently. This will then be represented in a diagram – probably a Gantt Chart – with deadlines clearly shown on a timeline. This structure will likely need to be reviewed and changed as the project progresses and problems mean that dates change and resources may no longer be available. This is a great method for small or medium-sized projects where there is a relatively simple set of deliverables. If the project becomes too large then the ability to represent the whole of the project in a single chain design becomes too difficult. 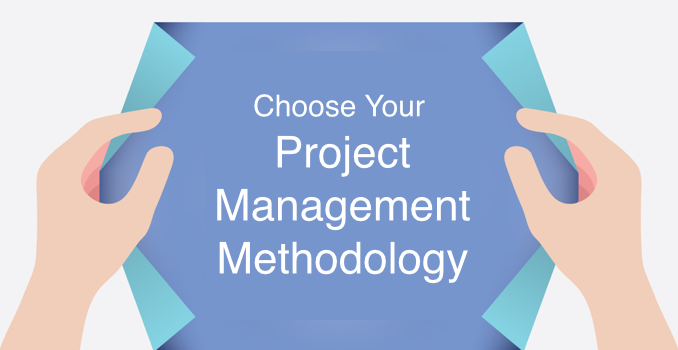 This is the project management methodology that is preferred by the UK government and represents a qualification in project management as much as a method – it is also used by the United Nations. PRINCE2 stands for Projects In Controlled Environments. Unlike some methods that promote a certain structure for the project, PRINCE2 suggests seven principles, themes and procedures. First, there are actions within a project – which are directing, managing and delivering. Then, there are stages of the project, which are pre-project, initiation, delivery stages, final delivery stage. What actions you take within a project are dependent upon the stage you are at. For instance, at pre-project, there will be a lot of directing more than anything else, whilst at the final delivery stage, there will be a combined focus on directing, managing and delivering. At each stage, PRINCE2 suggests a set of principles that cover the effective procedure and management principles. This is a complex set of criteria and advice, involving project boards and principles of documentation. You will find that, like Agile, to successfully apply this method requires training from a recognised educational provider. 3 Simple Ways to Ensure Project Success Using Six Sigma and Project Management Tools from DrexelGoodwin on Vimeo. Six Sigma is about constant evolution and improvement of the workforce involved in the delivery of a project. The assumption is that quality of performance can always be improved and that the application of statistics to processes can reveal where these efficiencies can be achieved. This is a vision for a whole organisation, rather than a single small project team. It assumes from the top down can be improved by people expert in understanding workflow data and its application. It is likely therefore that the organisation will have adopted another method of work management – or project management methodology – and then apply Six Sigma as a means of refining and improving this approach that best fits the individual context and workforce of that company. There are many other methods out there – some of which are subsets of these bigger principles. Scrum has become popular – but this is essentially the short and fast iterative processes of Agile in more detail. Kanban is also used by some – which is a way of representing the project like on a whiteboard with post-it notes. The post-it notes are moved along the workflow depending on progress made – but obviously now managed in software. There is also Adaptive Project Framework (APF) which like Agile assumes that the outcomes of a project are evolving and should be driven by a deeper level of client involvement. The basic principles of a project stay the same across methods. There needs to be a structure of some kind, an end-goal and a means of reflecting on whether the end-goal is being achieved. The methods differ in terms of the level of planning at the start of the project and the involvement of customer experience in the evolution of a project. Is it affordable to be flexible? Is it desirable to have a shifting and potentially drifting focus? These are the key questions when choosing the approach within your company. If you feel confident with different project management methodologies, check our guide to the best project management software to make your business even more organised! Product Owner vs Business Analysts: What’s The Difference?